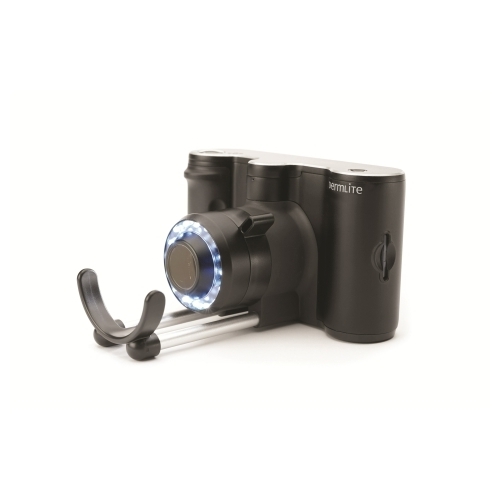 DermLite II Pro HR is the world’s brightest pocket Dermascope that you can attach to a camera right out of the box or use as a portable stand alone device. DermLite II Pro HR redefines the best in portable skin imaging. DermLite incorporates LED technology for bright-white, natural illumination. A superb 10x Hastings Triplet lens and advanced glare free crosspolarisation technology allows for a clear and deep view into pigmented lesions for detection of melanoma and dysplastic nevi in a matter of seconds. The DermLite Fluid is the only DermLite dedicated to traditional immersion fluid dermoscopy. 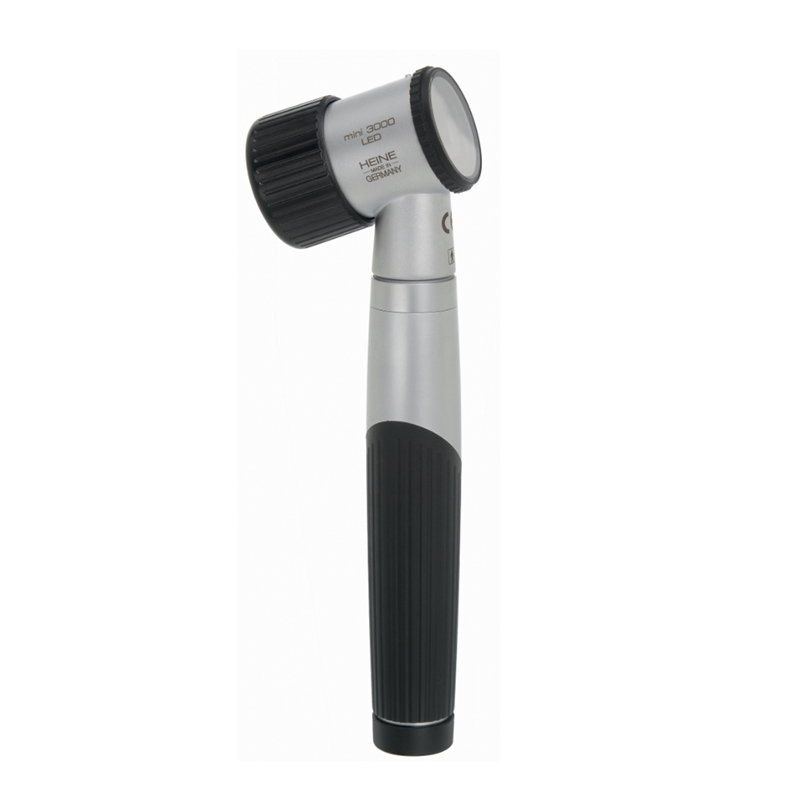 This powerful dermatoscope offers the most light of any comparable device in a palm-sized, portable design. The Fluid can be attached to a variety of compact digital cameras and SLR’s as well as the iPhone 4, 4/S and iPhone 5 (cameras require the use of stepping rings and or adapters), it's easy to document a lesion in its entirety, due to a surprisingly large field of view. DermLite carbon provides instant toggle control over lesion visualisation from the superficial structures to the deeper pigmentation, by separately activating two groups of lightemitting diodes (LED), each with distinct polarisation: The first group of eight LEDs produces cross-polarized light, ideal for visualising deep structures, whereas the second set of eight LEDs is linearly polarised, giving you a clear rendition of the skin surface. The DL3N has been developed to be the tool of choice for the world's leading dermatologists. Precision-engineered and crafted from solid aluminium, it is the first handheld DermLite to integrate a 25mm four-element lens, which offers greatly reduced optical distortion and a sharper image across the field of view, cross-polarised & non-polarised lighting, low-battery indicator, charging base, and a fully enclosed, removable aluminium faceplate spacer. In each DL3N, twenty-eight high-powered LEDs produce approximately 30% more illumination in cross-polarised mode than in a DermLite II HR, and seven non-polarised LEDs for immersion fluid dermoscopy create a brighter image than the equivalent mode in a DermLite II hybrid. For optimum ease of use, one button does it all: A quick tap instantly toggles between polarisation modesFor optimum ease of use, while the optional PigmentBoost mode produces a warmer illumination reminiscent of conventional dermatoscopes., and a longer push turns the unit on or off. A major step forward is the DL3N's fully retractable faceplate spacer design and focusing mechanism. By twisting a large precision dial that is as easy to turn when mounted on a camera as it is during regular use, you extend its faceplate spacer and focus your image with an available focal range in excess of ±4mm or -5.5 to +7.6 diopters (DermLite II: ±1mm). The innovative spacer comes with a glass faceplate with 10mm scale, and due to its fully enclosed design, it is easy to clean and keeps the critical optical components completely sealed. Now, contaminants as well as undesirable ambient lighting no longer affect your image. Of course, the DL3N is camera compatible. Attach your digital camera* via the product's built-in threaded 28mm connection, extend the spacer, and start taking sharp, glare-free images quickly and easily. The same 28mm connection may be used to mount the included eyepiece, which may greatly improve the contrast of the image and helps reduce internal reflections caused by ambient lighting. DL3N is powered by the same integrated, rechargeable lithium-ion battery used in the DermLite II series, which can be recharged via the included charging base. A DermLite DL3 will let you know when it's time for a recharge: While using a fully charged DL3N, the "3" on the top of the unit lights up green; once the charge level drops below 25%, the "3" will glow orange. 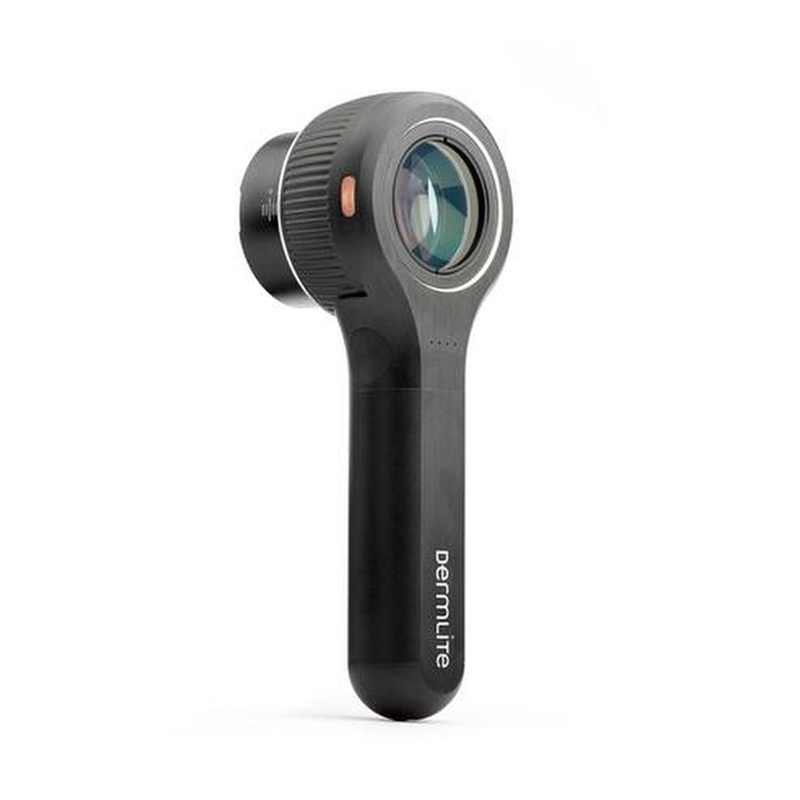 DermLite DL3N combines the unique advantages of polarised and immersion fluid dermoscopy in one truly refined device that offers superior illumination and optics, solid durability, and, with its ergonomic handle design and single button operation, a degree of convenience that is unsurpassed in a DermLite. DermLite Cam® is a state-of-the-art digital dermoscopy camera designed to enable anyone in your office to capture repeatable high-resolution dermoscopic & clininal images–quickly and easily. With over 1 million images captured to date, it is one of the world's premier digital dermoscopy workhorses. The DermLite Cam is easy to use. Captured images are automatically numbered in sequential order, saved to an SD card and displayed on its high-resolution touch screen. 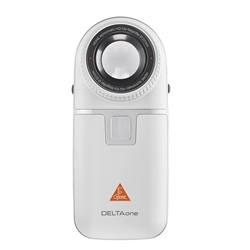 The intuitive DLCam® interface provides only those functions that are actually needed: Image review including double-tap zooming and image deleting, that's it. 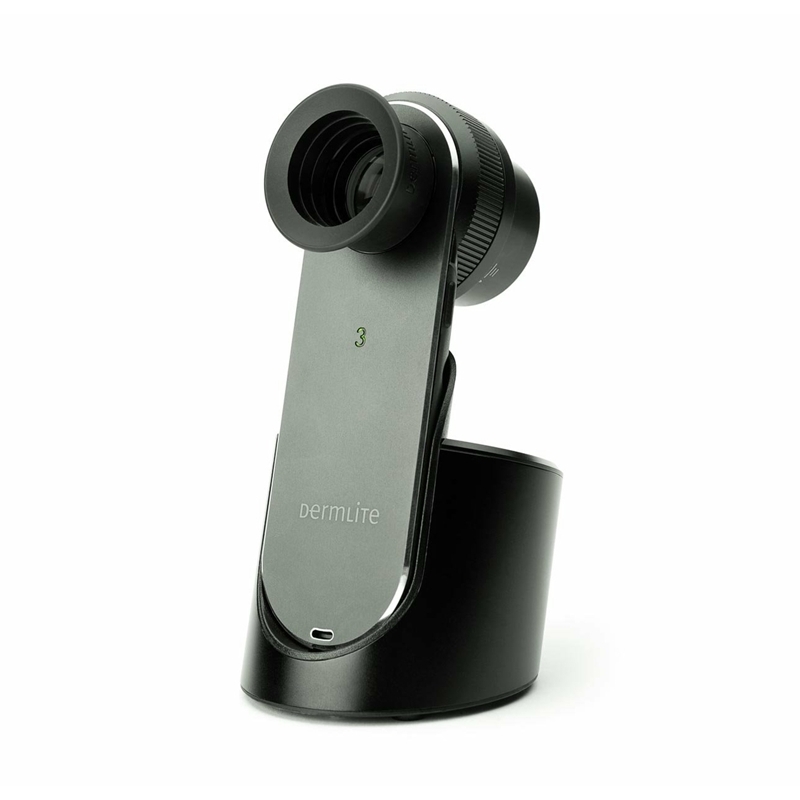 DermLite Cam is the future of dermoscopy. Get yours and be a part of it. See deeper. Even into the battery. DermLite DL4’s high-powered LEDs and rechargeable battery produce light in an extremely energy-efficient way. And, in order to know when you run out of battery, DL4 now has a more granular four-level charge indicator. If you need to recharge, you can do so from any USB port using the standard Micro USB to USB cable included with each DL4. In its elegance and compactness, DermLite DL4 is simply the most capable dermatoscope available. 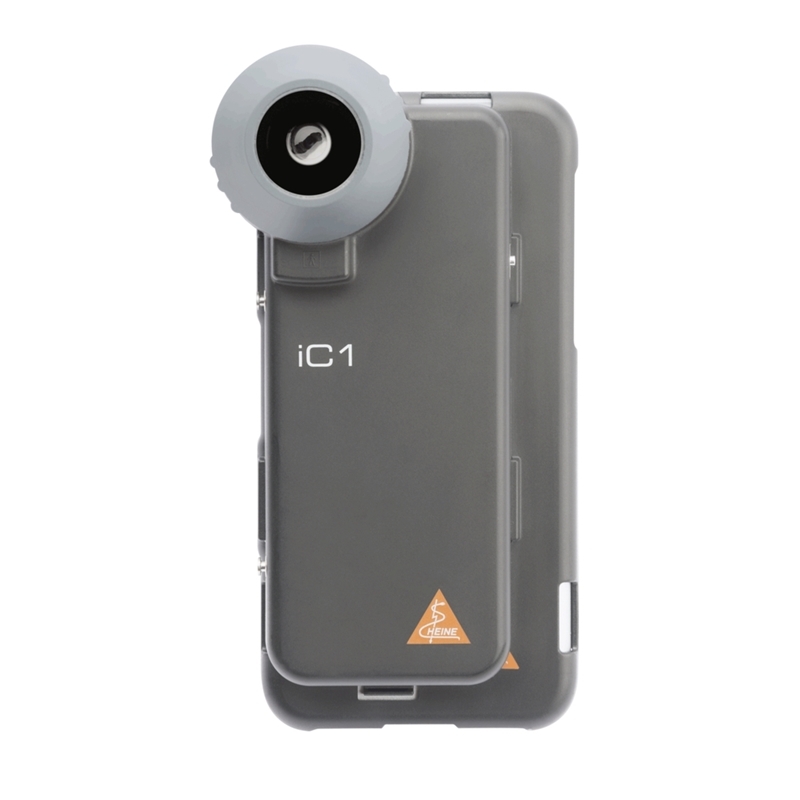 The iC1 allows you to take sharp and shadow-free images thanks to the precise, aspherical optical system with up to 40× true magnification and the 12-megapixel image quality when using an iPhone® 6s or a later model. Simply download iC1 App, insert your iPhone and experience digital dermatoscopy like never before. 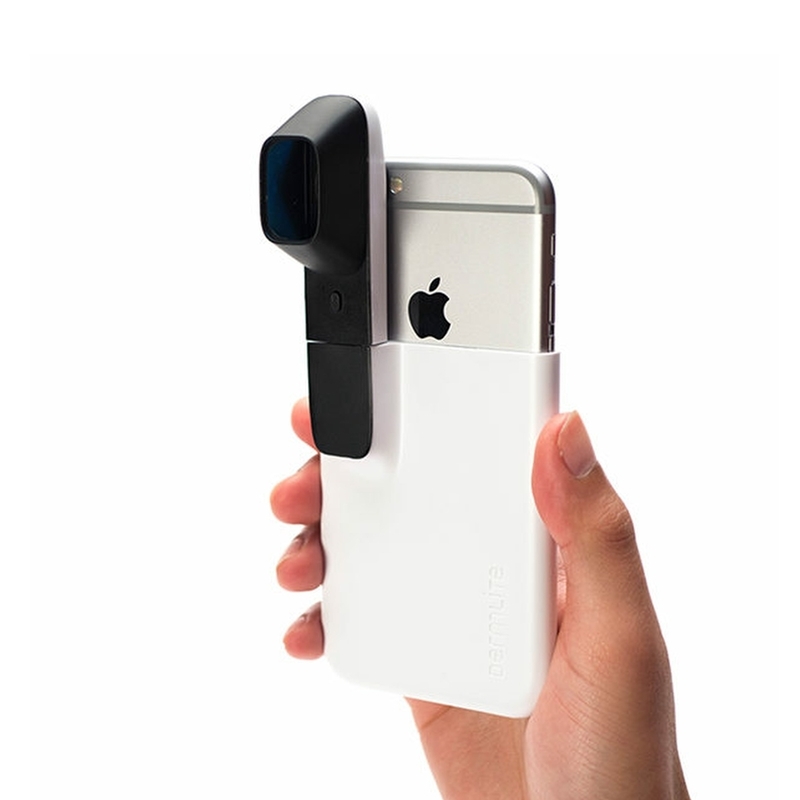 DermLite HÜD™ attaches to your smartphone using one of the included adapters and enables you to capture highly magnified dermatologist-grade photos of moles or other skin lesions you can share with your dermatologist. DermLite HÜD includes a polarized USB-rechargeable skin magnifier, a slide-on adapter for iPhone 7 and a universal adapter that works with virtually any smartphone with a screen size ranging from 4" to 5.5”. Once you receive your HÜD™ download the First Derm companion app, available on iOS or Android. The app is designed to educate you on what to look out for in regards to skin cancer. It is also a convenient way of tracking and storing your HÜD images.